FASS 125 GPH Titanium Signature Series (TSD11125G)This FASS Titanium Signature Series pump with "Whisper Technology" flows 125 GPH capable of 600 HP. The Titanium Signature Series Fuel/Air Separation System was designed specifically for the diesel pickup market, and utilizes the same blueprint as the proven FASS HD Series, just in a smaller package. Built into a smaller compact much quieter version, the Titanium Series offers flow rates up to 220gph. This size difference allows you to tuck the pump closer to the frame for better clearance and less visibility without sacrificing any of the features known to FASS systems. This FASS Titanium Signature Series pump with "Whisper Technology" flows 125 GPH capable of 600 HP. 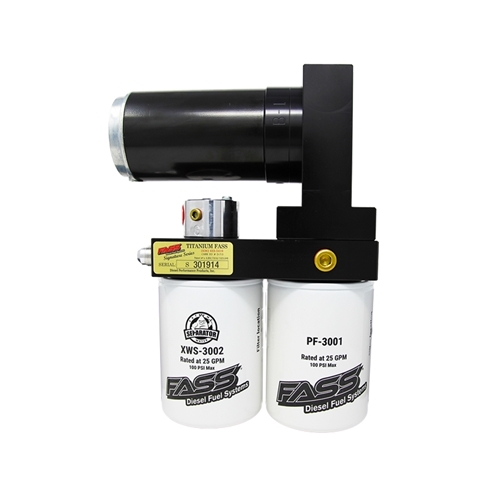 The Fass Titanium Signature Series also offers advanced filtration to help protect your injection system, prolonging the life of your injection pump and injectors.